Phenom II X3 740 triple-core microprocessor was introduced in the third quarter of 2009. At the time Athlon II X3 line of processors was not announced yet, and the fastest quad-core Phenom II CPU was model 965 with 140 Watt TDP. As all other Phenom II X3 CPUs, the 740 includes three cores, each with its own level 1 and level 2 caches, and shared 6 MB level 3 cache. The package also incorporates memory controller that supports DDR2 memory on socket AM2+ motherboards, and DDR3 memory on socket AM3 motherboards. To communicate with peripheral devices the CPU uses one HyperTransport link clocked at 2 GHz. The Phenom II 740 operates at 3 GHz, and, as of September 2010, along with B75 model it is the fastest triple-core Phenom II-branded CPU. Clock multiplier on the microprocessor is unlocked, and it can be easily overclocked by changing the multiplier in BIOS. CPU features are standard for Phenom IIs: 64-bit instructions, enhanced virus protection and Virtualization. This Phenom II includes various power saving features, that reduce power consumption by turning off parts of the CPU, or throttling CPU frequency down when the processor is idle. The 740 has C2 core stepping, consumes less than 95 Watt, and is manufactured in 938-pin package. OEM version of the microprocessor was shipped in a number of OEM systems: HP Pro 3015, HP Pro 3005, HP Pro 3120 and Lenovo ThinkCentre 3317, just to name a few. The Phenom II X3 740 was never offered as a boxed processor. At default frequency, the 740 is somewhat faster than other members of Phenom II X3 family. 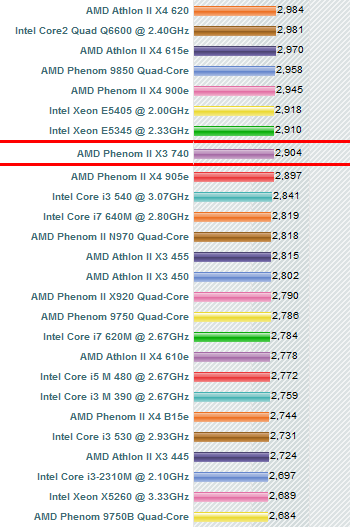 For instance, the 740 is about 3% - 7% faster than Phenom II X3 720, and 6% - 14% faster than Phenom II 710. The Phenom II 740 also has higher performance than similarly clocked triple-core Athlon II 440 processors, ADX440WFK32GI and ADX440WFK32GM. On average the 740 has 7% - 10% better performance than the 440, and in some tasks it could faster up to 15%.